If you decide to sell diamond jewelry in NYC, you must be confident that you have found the best place in town to authenticate your precious jewelry. With NYCBullion, you can be 100% sure you came to the right place! As a reputable diamond grader and buyer, we ensure a safe and pleasant experience by providing you with a top-notch assessment of your diamond jewelry. Each piece is thoroughly examined in front of you, to give you a simple, transparent and straightforward evaluation of your belongings. Our certified experts use only official licensed scales to provide you with the most accurate information about your diamond jewelry. At NYCBullion, you can feel confident and secure that you’ll receive a fair and high offer with no selling of diamond jewelry under pressure. Visit us and get your shiny quote today! Are you asking yourself “Where can I sell my diamond watch?” or “Where can I sell my diamond necklace?” You can stop your searches because you’ve found the right place! Sell your diamond jewelry here at NYC Bullion – our professional team of top-notch experts will ensure that you receive a personal, modern and comfortable experience when you decide to sell any diamond jewelry – necklace, earrings, rings or watches. They will evaluate each of your diamond jewelry pieces according to its main particularities – carat weight, clarity, cut, and color – and give you an irresistible and fair cash for diamond offer. Now you know where to sell diamond jewelry - simply come to the Diamond District area in NYC and visit our store to get your fabulous quote today. Haven’t found an answer for “How to sell my diamond necklace?” yet? With NYC Bullion, you can use two possibilities to get cash for diamond jewelry – in-store or online. Visit our store in the heart of NYC, in Manhattan, and get the most accurate appraisal of your diamond jewelry. You can easily distinguish trustworthy diamond buyers, like NYCBullion, from unreliable stores because the latter will struggle to determine the true value of your diamond. At NYC Bullion, our team of licensed and experienced jewelers uses only officially certified and calibrated scales to measure your diamond necklace, watch, rings or earrings – Just stop by and get your quote today. 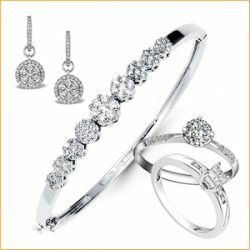 Or, you can complete the “Get an offer now” section on our website and receive your cash for diamond jewelry by e-mail. When it comes to selling diamond jewelry, we buy diamond necklaces, watches, earrings, and rings. Each jewelry piece is thoroughly assessed by our expert team, to authenticate its carat weight, cut, clarity, and color, which are the key features that determine the value of diamond jewelry. If you find yourself in the position of selling your diamond necklace or watch, you can be confident that here, at NYCBullion, you will receive the most professional evaluation from our top-class jewelers with years of experience in the diamond market. For more details on other diamond jewelry pieces, visit our pages about selling diamond earrings and rings. You can be completely confident in having your diamond jewelry in the hands of our assessors – the whole authentication process is fully transparent and performed right in front of you. Don’t hesitate anymore and visit us in the Diamond District in New York City today.